In 2002, in a surprise decision, the then Defence Minister announced that the planned AIR 6000 flyoff to choose Australia's future fighter aircraft was to be effectively stopped, with the developmental Joint Strike Fighter declared to be the preferred aircraft type. 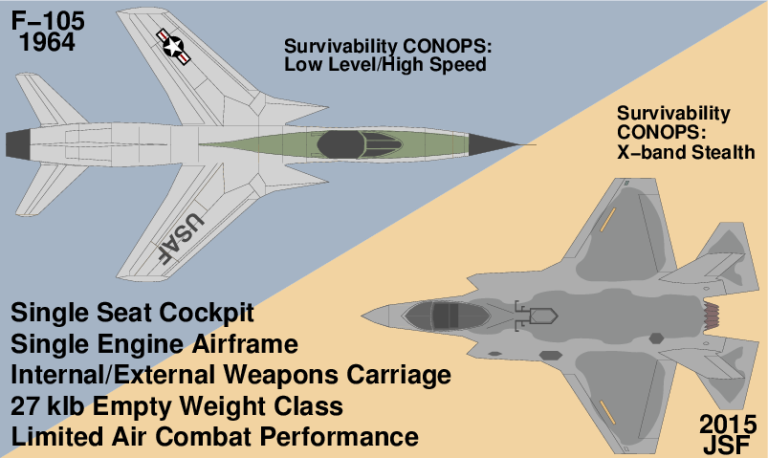 The Joint Strike Fighter is not designed to perform air superiority roles, unlike the larger F-22A, and is not well adapted to performing the penetrating long range strike role filled by the F-111 until 2010. There has been considerable adverse press associated with JSF cost overruns, project delays, and other difficulties observed in this program. The JSF Program and resulting aircraft designs have, since the very first days of the program, been burdened by fatal optimism, a total indifference to what is real, placement of form over substance, the acquisition malpractice of concurrency and the fact that the STOVL F-35B is the baseline for all three variants, having dictated and constrained most if not all key aircraft parameters in the definition and resulting design of the other two JSF variants. 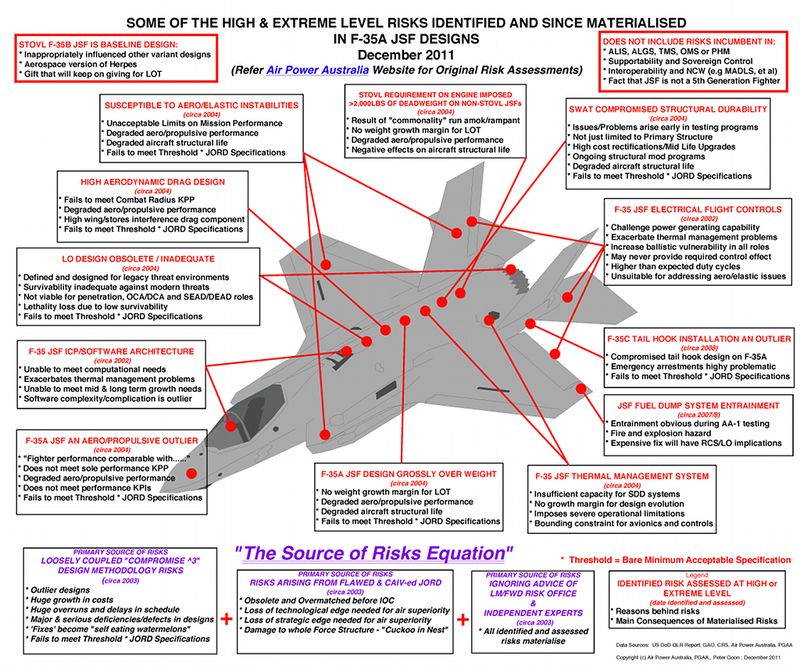 The F-35 JSF aircraft designs will not meet specification nor the operational requirements laid down in the JSF JORD (Joint Operational Requirements Document) by significant degrees, noting that these operational requirements and resulting specifications, themselves, were predicated on the capabilities of reference threats from an era past and subsequently subjected to the illogical and deeply flawed process known as CAIV (Cost As an Independent Variable). 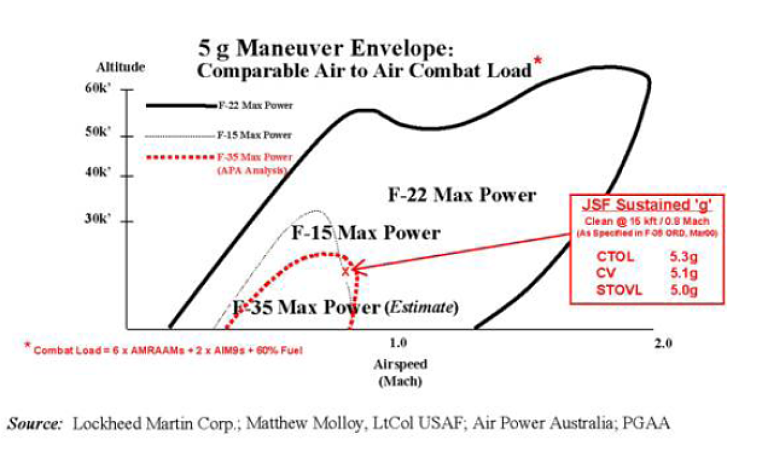 The designs of all three JSF variants are presenting with critical single points of failure while even the most basic elements of aircraft design (e.g. 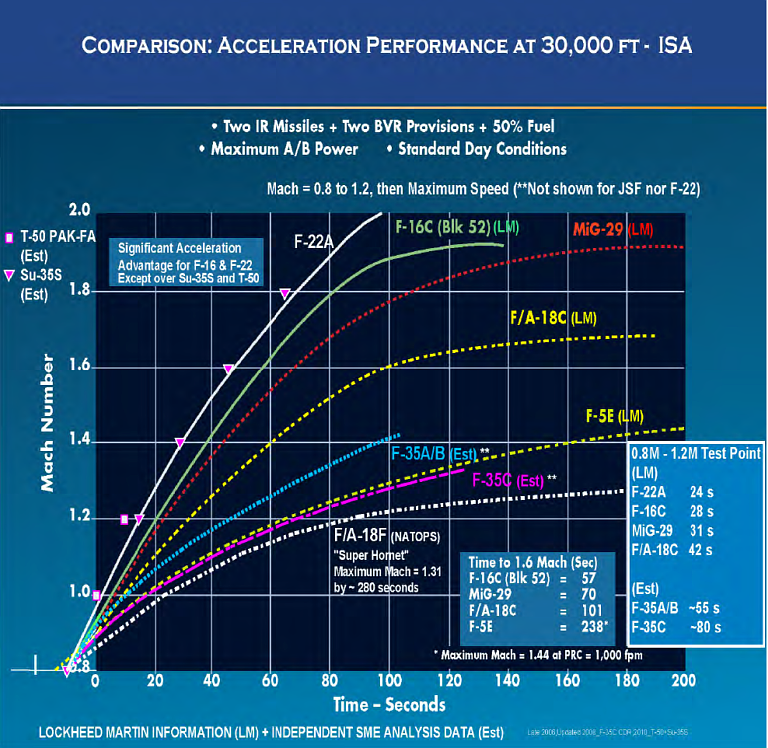 weight, volume, aerodynamics, structures, thermal management, electrical power, etc.) will almost certainly end up in what Engineers call "Coffin Corner". 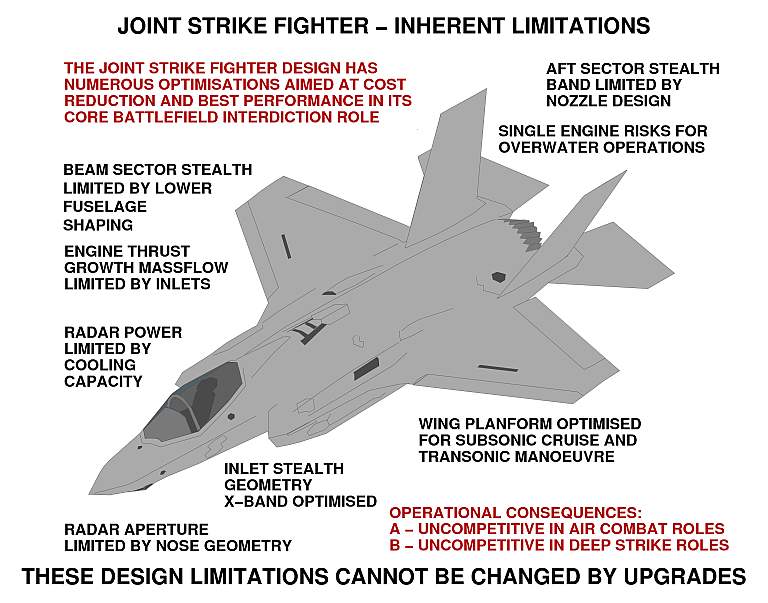 In essence, the unethical Thana Marketing strategy used to sell the JSF, along with the acquisition malpractice of concurrency in not only development, production and testing but the actual designs of the JSF variants, themselves, have resulted in the JSF marketeers writing cheques that the aircraft designs and JSF Program cannot honour. A more detailed summary of these points is available in Hansard, Parliamentary Joint Committee on Foreign Affairs, Defence and Trade, 07/02/2012, Inquiry into the Department of Defence annual report 2010-11 and associated Submissions by Air Power Australia. Further technical discussion can be found in the OSD DOT&E FY2012 Annual Report. This website indexes a selection of relevant articles, submissions and papers. First distributed publicly in December, 2011. Is the JSF Really a Fifth Generation Fighter? 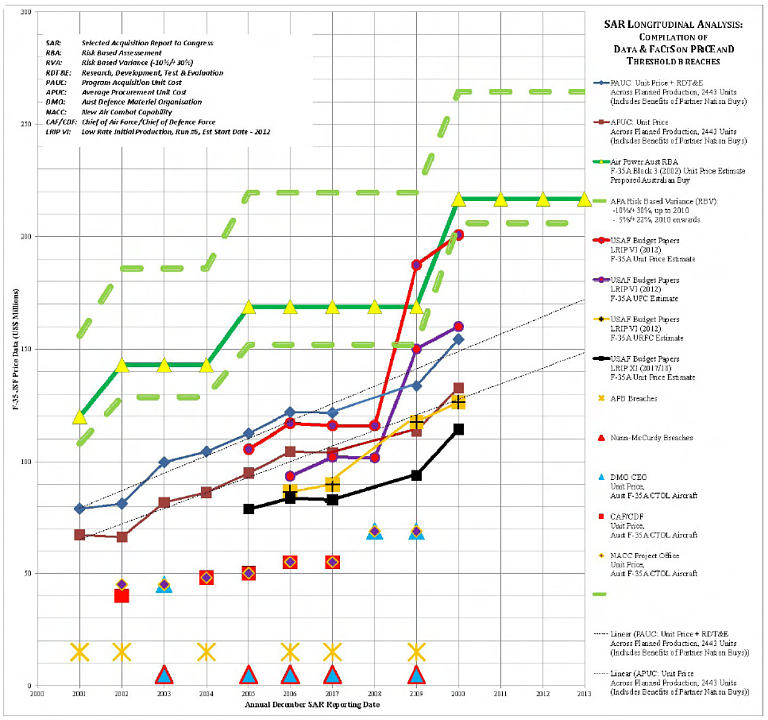 Table © 2009 - 2013, Peter Goon, Air Power Australia, Peter Goon & Associates. First published in Submission #26, p5, Inquiry into the Defence Annual Report 2010-2011, Joint Standing Committee on Foreign Affairs, Defence and Trade, Parliament House, Canberra, 2012; Updated with data from FY2012 DOT&E Annual Report (OSD). First published in Submission #2, p15, Inquiry into the Defence Annual Report 2010-2011, Joint Standing Committee on Foreign Affairs, Defence and Trade, Parliament House, Canberra, 2012. The JSF program sets new benchmarks for exceeding initially intended Unit Procurement Costs in a weapon system being developed. These publications detail the scope, scale and nature of the program's failure in this area. 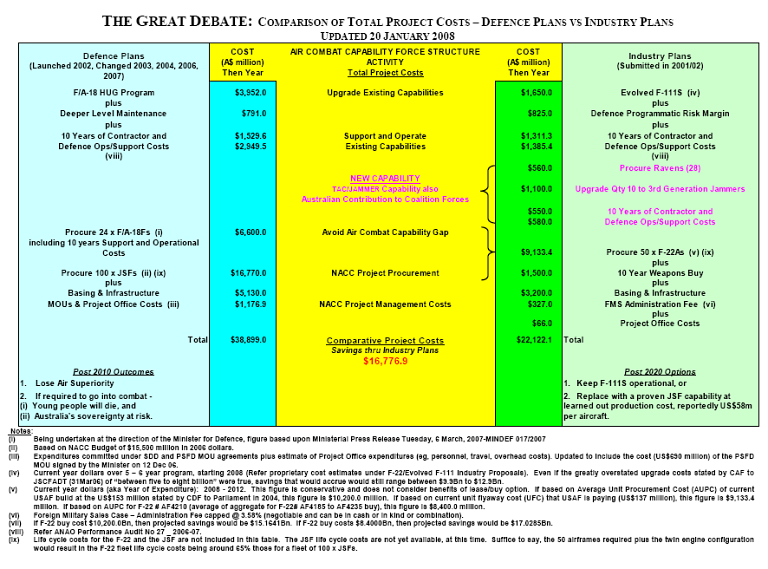 F-35 JSF Program: When is “Affordability” Not? 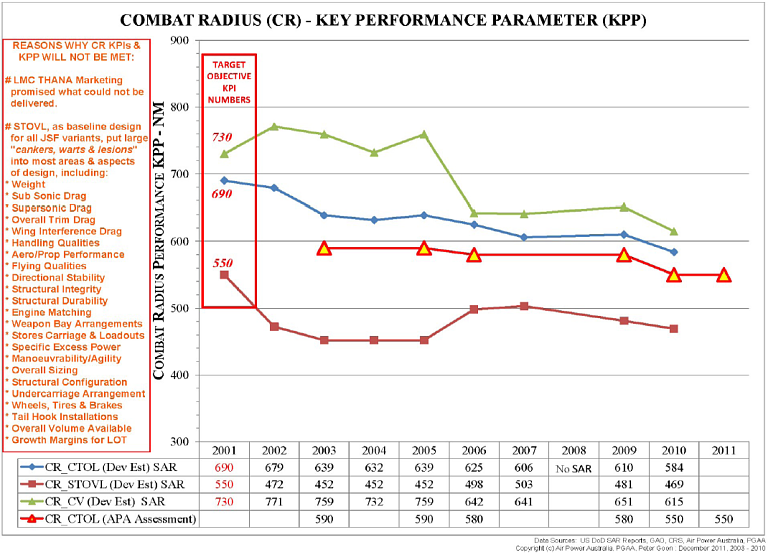 The JSF program is almost unique historically in the extent to which its intended survivability and lethality are mismatched against the operational environment in which the aircraft is intended to be used. These publications detail the scope, scale and nature of the program's failures in these areas. Why F-22A Raptor instead of F-35A Joint Strike Fighter? 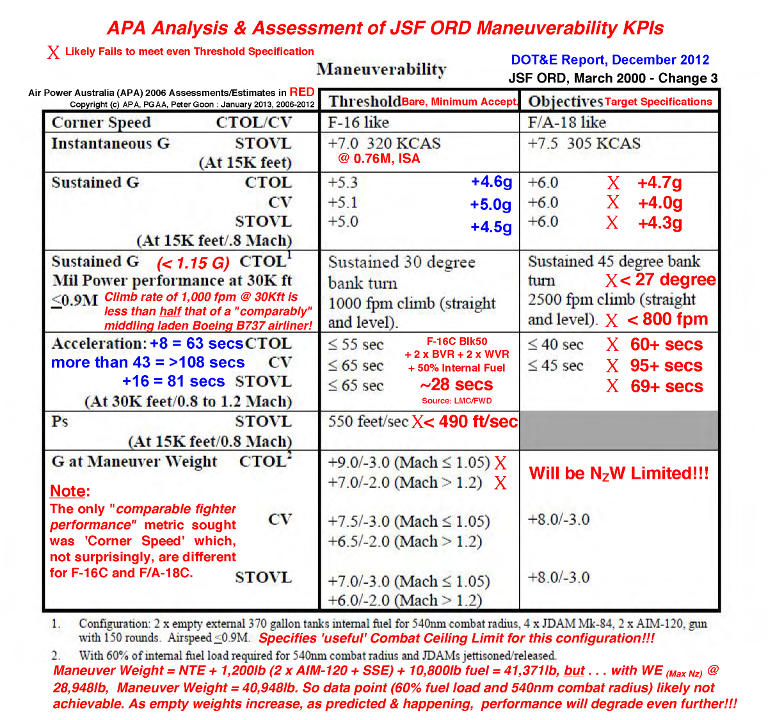 Is the JSF really good enough? JSF F-35 Program: How Many Miles Does an F-35A Go On a Tankful of Gas? F-35 JSF: Can It Meet Canada's Needs? United Kingdom: F-35 or F-22? Hedging the Bet- JSF for the RAAF? 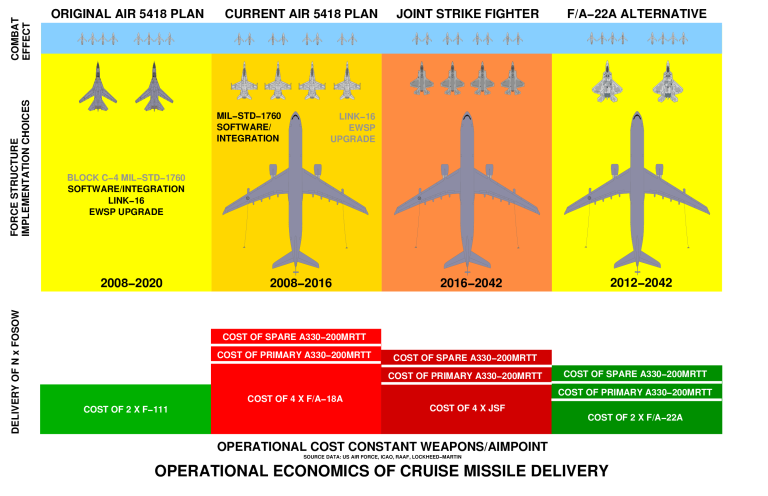 Lockheed-Martin F-35 Joint Strike Fighter - Part 1 - A Cold War Anachronism? The JSF program introduced an unprecedented governance scheme in which the customer became a defacto marketing entity acting on behalf of the supplier, and in which concurrent development and production were planned for. These publications detail the scope, scale and nature of the program's failure in this area. Mr Secretary - Why Does the Pentagon Say the JSF is a 5th Generation Fighter . . Really? The JSF program has produced a design which will be unusually challenging to operate in established operational environments, requiring unprecedented changes to the operating environment rather than design. These publications detail the scope, scale and nature of the program's failure in this area. Part 1 - A Cold War Anachronism? First published in Submission #2, p16, Inquiry into the Defence Annual Report 2010-2011, Joint Standing Committee on Foreign Affairs, Defence and Trade, Parliament House, Canberra, 2012. First published in Submission #2, p4, Inquiry into the Defence Annual Report 2010-2011, Joint Standing Committee on Foreign Affairs, Defence and Trade, Parliament House, Canberra, 2012. First published in Submission #26, p6, Inquiry into the Defence Annual Report 2010-2011, Joint Standing Committee on Foreign Affairs, Defence and Trade, Parliament House, Canberra, 2012. What would an F-22A Raptor look like in RAAF colours? The Joint Strike Fighter best compares in its roles and missions, sizing and relative capabilities to the Republic F-105D Thunderchief, the workhorse of the US bombing effort during the Vietnam conflict. What is remarkable is the extent to which a similar roles/missions requirement, defined almost four decades later, produced a combat aircraft of nearly identical size and weight. Like the F-105, the JSF is not designed to be a top end air superiority fighter, but is designed with was intended to be a robust self defence capability.